If you have seen big Packard automobiles in movies and you want to check them out then head over to America’s Packard Museum. It is in downtown Dayton on 420 S. Ludlow Street. It is open seven days a week in the afternoons. The building is a restored Packard dealership that is now a museum that displays twentieth-century classic Packards and historic Packard artifacts and memorabilia. Robert Signom II, the museum&apos;s Founder and Curator, acquired the building in 1991 and painstakingly rehabilitated it to its original Art Deco grandeur. 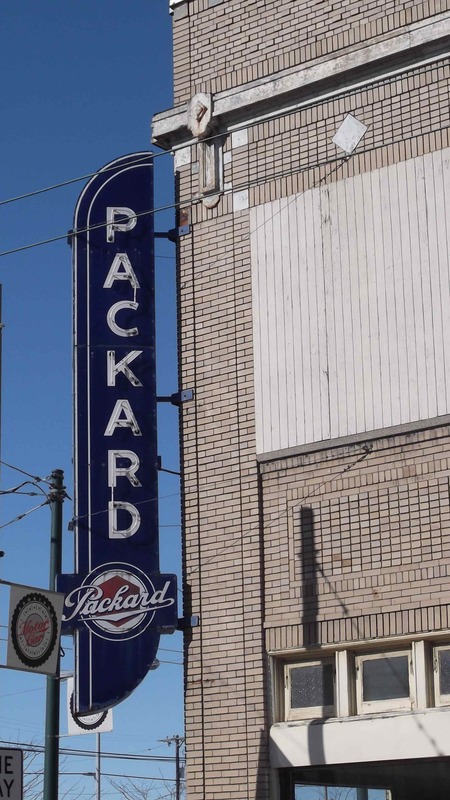 The original 20&apos; tall porcelain and neon Packard sign, removed from the building in the early 1940s, returned to its former position at the corner of Ludlow and Franklin Streets in 1992, for the grand opening of the museum. As you enter the door you will be amazed of the era….the furniture, the office, the everything is the 1950’s. And then you will actually see the Packard automobiles. They span the years from the early years of the 1900’s to the end of the era in the 1960’s. More than 50 cars are on display, from 1900s Brass Era cars to the streamlined Classic cars of the 1930s and 1940s, and modern Packards of the 1950s. There are also war machines, parts, accessories, and original sales and service literature. 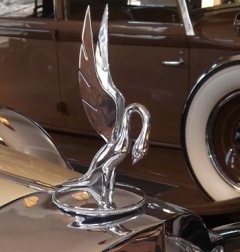 Be sure to be looking at the Packard ornaments which were used for their radiators. 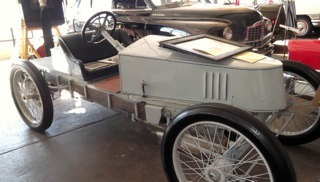 The Gray Wolf was a one time car that set the World Land Speed Record in 1904. 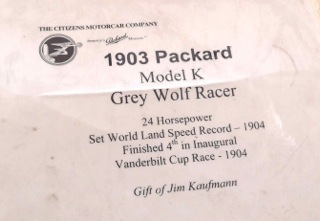 There are photos and info of the Packards when they were in the Indy 500. Time: 1902. Place: Office of J. W. Packard. 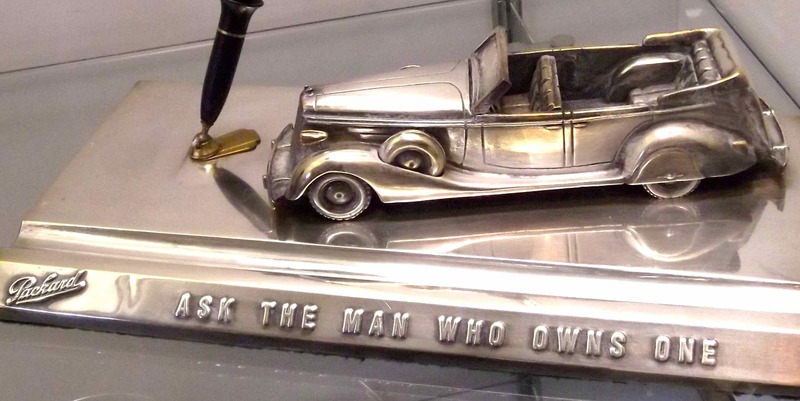 His secretary speaks: “Here’s a letter from a man who wants information about the dependability of Packard cars.” Replies Mr. Packard: “Since we have no sales literature yet, tell him to just ‘ASK THE MAN WHO OWNS ONE.’” Thus was born the Packard slogan. This 43 year slogan expresses the confidence Packard has in its product. As you look around you will also see so many other Packard items such as all kind of memorabilia, logos, cigarette ashes and more. 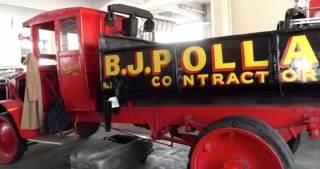 And you also will see many old automobile maintenance items….oil cans, bottles, tools, and many other items as well. Be sure to look at the various Packard advertisements as well. 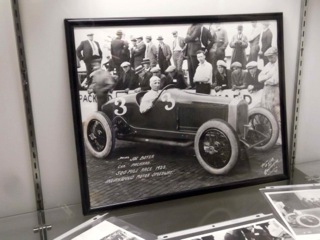 Since that time, the museum has grown in size and stature, winning the James Bradley Award of the Society of Automotive Historians in 2004. Car Collector magazine has also named the museum one of its "Top Ten" automotive museums. After checking out the Packard museum if you are wanting more info go to Wikipedia. They give a good history and evolution of The Packard. 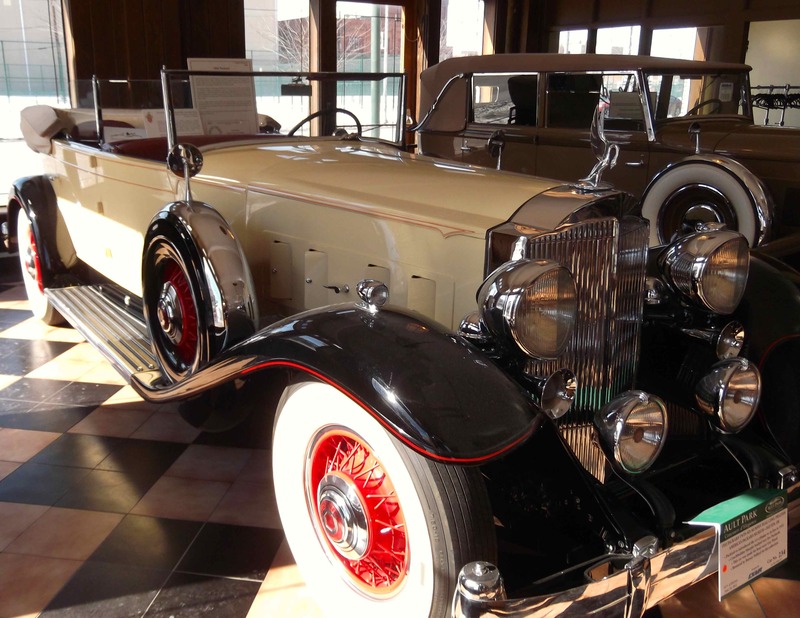 Please note: The Dayton CVB has compensated me to share my thoughts on the Packard Museum.